The high cost of solvents and the resulting waste cause unnecessary costs that can be easily saved with an effective solvent recycling system. For a typical printer, one drum of virgin blanket wash used on the press results in about two drums of waste that can cost in excess of $300 to dispose of. 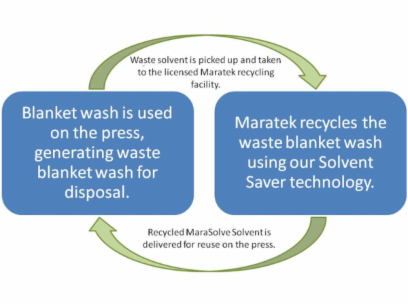 By recycling that used blanket wash, you capture nearly all of the solvent to reuse with less than $20 of waste to ship. This results in a 95% reduction of hauling and disposal costs with less new blanket wash to purchase! There are many benefits to solvent recycling – here are our top 3!